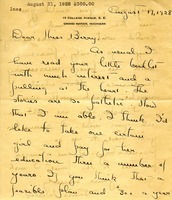 Louise Wilcox sends $300 to sponsor a girl's education at the Berry Schools. She asks Martha Berry to send her the name of any girl, except one with 'missionary tendencies', so that Louise can write her occasionally. 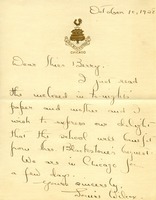 Louise Wilcox writes to Martha Berry to express her pleasures that the Berry Schools will benefit from a bequest from Blackstone.